If you ever find yourself in the unfortunate predicament of being stranded outdoors in the snow, don't eat snow off the ground. Eating solid snow will sap your body of precious internal heat (since the heat will be used to melt the consumed ice), so it is best to melt the snow completely before drinking to stay hydrated. Other tips to survive winter worst-case scenarios? Find a shelter if possible, but if you can't, build a snow bank to insulate yourself against the wind and cold temperature. Create a fire to keep yourself warm and to alert potential rescuers, and surround the fire with rocks so that the rocks can absorb and reflect heat. 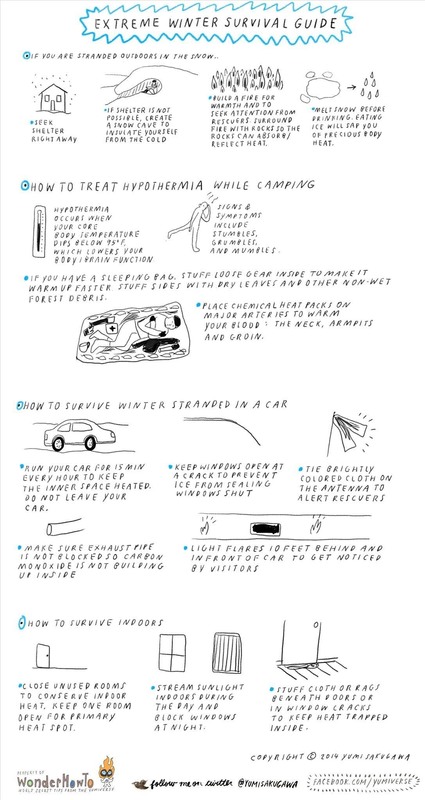 Check out the other survival tips below for remedying hypothermia, surviving while stuck in a car outdoors and surviving indoors with no heat or electricity. News: Extreme 3D Illusions in Farmville!